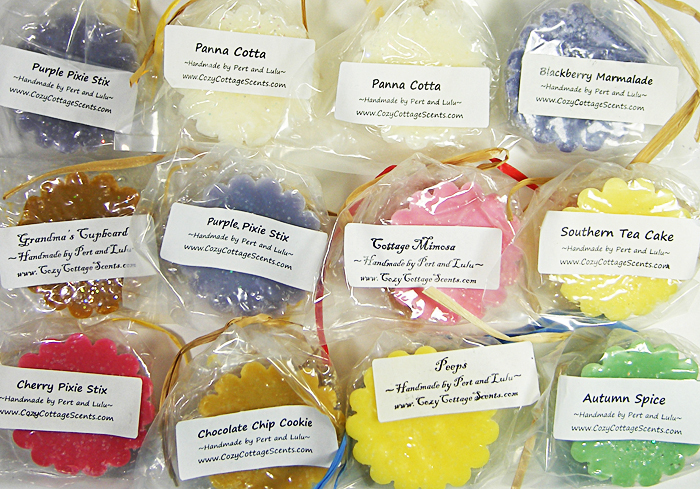 Cozy Cottage Scents or CCS for short. Baked Alaska Does anyone still serve Baked Alaska? We're here to bring it back! Vanilla ice cream layers of sponge cake and topped with meringue are just the beginning. The drama comes from the spalsh of rum poured on the Baked Alaska and then flamed table side. The meringue takes on an entirely new flavor! What I really would like, is another bite of this! Blackberry Marmalade Hard to pick which we like better, our Cranberry Marmalade or our Blackberry Marmalade. This has an absolutely authentic blackberry scent so real you can taste them as they burst open with juiciness. Add a little sugar for sweetness and simmer down to bring out the natural flavor. You can picture the handwritten label on the jar! Bonfire Bliss Reminiscent of gentle dusky breezes and bonfires with notes of dried wind-blown leaves heliotrope cedar amber smoky sandalwood and cinnamon musk with a background containing hints of roasted marshmallows brown sugar and soft vanilla. A truly beautiful lightly spicy fragrance with very very subtle smoke in the background. --Ooo! Woodsy, yet sweet and campfire smelling! Definitely picking out the marshmallow in this and surprisingly, the sandalwood is not turning my nose away! I really do like this one! Butterscotch Toffee (butterscotch brulee?) Not sure if this will give you shivers of joy or cavities! Perfect scent of creamy butterscotch. This is one of Lulu's favorites! --Simply delicious! I could eat it, better yet I will just huff it and save the carbs! I do get a little bit of a plastic aftersmell (is that a word? it is now! ), but its not horrible, hoping it will be unnoticable while melting. I think this was mislabeled, either way its the same thing! Cooking sugar to a certain heat point makes toffee. :D -dusts glitter off hands- weee! Candy Corn This is so yummy they now make a version of this for all the holidays. Vanilla maple butter honey and sugar blended for one of a kind flavor and great throw in a tart. --sniffs tart, sniffs bowl of candy corn- Not exact, but it is very sugary with a touch of butter. I get a barely there maple too, I'm curious how this will smell when warmed. The cold throw is between medium and strong on this one! Cherry Pixie Stix Our Purple Pixie Stix are a best seller which made us determined to make a perfect Cherry flavor. We did it! The right tartness, nothing artificial, all the cherry candy goodness of the sugary treat. Chocolate Chip Cookie Sometimes even we are amazed at how perfect a scent can be. Whether you're a slice and bake cookie maker or carefully blend your ingredients from scratch, chocolate chip cookies have a one of a kind aroma as they come out of the oven. We promise we have captured that piece of heaven! Cottage Mimosa No doubt this will be a top seller. Bubbly notes swirled with berries make for our very own mimosa drink. Sitting on the porch of the summer cottage, watching the sun come up or go down, enjoying this sparkly, fruity drink. Don't wait for Sunday brunch! --A very nice blend of berries and orange juice. Its sweet yet not overly tart, the orange is kind of hidden in there but I can smell it. Great for a morning burning, quite refreshing! Cottage Sangria An easy breezy summer wine cooler, cottage style! Mountains of finely sliced and chopped fruits, from oranges to berries, peaches and pears, swimming in sweet red wine. We like to add a splash of Triple Sec to keep the party lively. Come join the celebration! If you'd like our real recipe for your next party, email us! Custard Cream Cake NEW - Really, you'll wish this was a real cake. Moist yellow cake with inches and inches of creamy custard filling. Sweet butter, bakery vanilla, powdered sugar and cake, cake, cake! 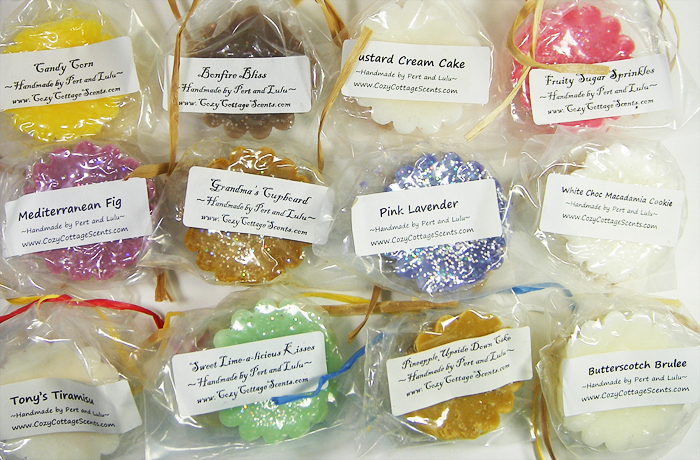 A fantasy come true for all our bakery scent lovers. --VERY strong buttercream notes with a base of vanilla cake, all topped off with sparkling sugar. Very strong on cold sniff! weeee! I have glitter all over me! woops there it goes down the shirt! oo this baggie is crunchier than the others, oh yeah, scent reviews! Frosted Winter Berry A juicy, spicy, berry blend with notes of milky amber, creamy French vanilla, cinnamon and caramelized sugar. Much more complex than the name implies, this scent is a must-have for fruit lovers! --Very cinnamony on cold sniff, I do pick up the vanilla and a teensy bit of berries. Cold throw is fairly strong. I am hoping the amber and caramel will come out to play when melted! Grandma's Cupboard Cookies baking in the oven at Grandma's house! Is she making Oatmeal Raisin, Chocolate Chip or Sugar Cookie or maybe all three? Stronger than a Sugar Cookie but not as spicy as an Oatmeal Cookie. Fresh baked goodness! Marshmallow Fluff - our own blend Sweet gooey marshmallow! The perfect blend of butter sugar and vanilla. We think our Marshmallow is the best you'll find! Absolute perfection. --straight up marshmallow goo! SO super yummy! This tart makes me want to get body products in Marshmallow, like, now! 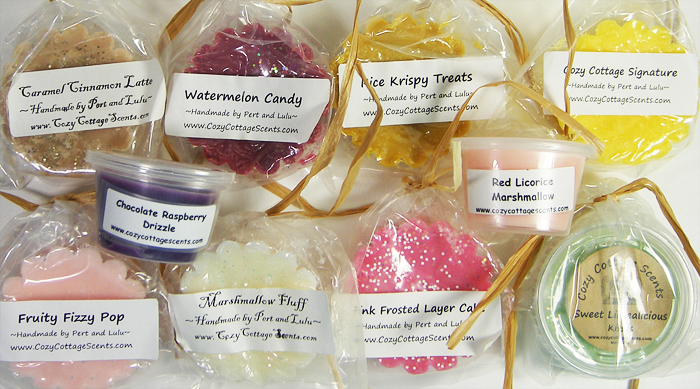 -bumps cocoa pink to top of wishlist!- No plastic, no sawdust, just straight-up yummy gooey marshmallow! **Over the Rainbow This fragrance will take you to the world of wishes that come true. With base notes of white and dark chocolate it smells almost edible! Other notes include violet fresh jasmine musk blackberries and vanilla. Hard to describe and even harder to forget. Panna Cotta This delicious Italian dessert is a decadent and thick creamy pudding with vanila bean, sugar, and sweet cream. Luscious and delicious, this is a scent every bakery and vanilla scent addict must try! Our version is perfect with outstanding throw. --Highly recommended by our very own jennistarbrite @MUA, I just had to try it - twice! This is a very very rich sweet gooey buttery creamy vanilla tart. Wow is just about all I can think of to say about this one. Super strong on cold throw, I'm sure its going to be way strong when melted! Thank you for the rec Jenni! peeps Chicks and bunnies of marshmallow dreams coated in sugar sprinkles. Do you like them fresh and fluffy or a week old and chewy? Save some to toast over a campfire amazing! --Straight up marshmallow and sugar. No other way to put it. :D I am not sure of how strong this will be melting, as it seems a little soft on cold throw. **Pink Frosted Layer Cake This is NOT a Pink Sugar Blend - this is a Philosophy dupe. We could hardly wait to finish creating this magnificent scent. Our "philosophy" was to take yummy cake, lots of sugar, sweet berries and vanilla frosting to a level of cake fantasy unlike any other. Bakery lovers will build a little shrine to this one. --OMG this is soooo delicious smelling! Someone hand me a spoon, stat! 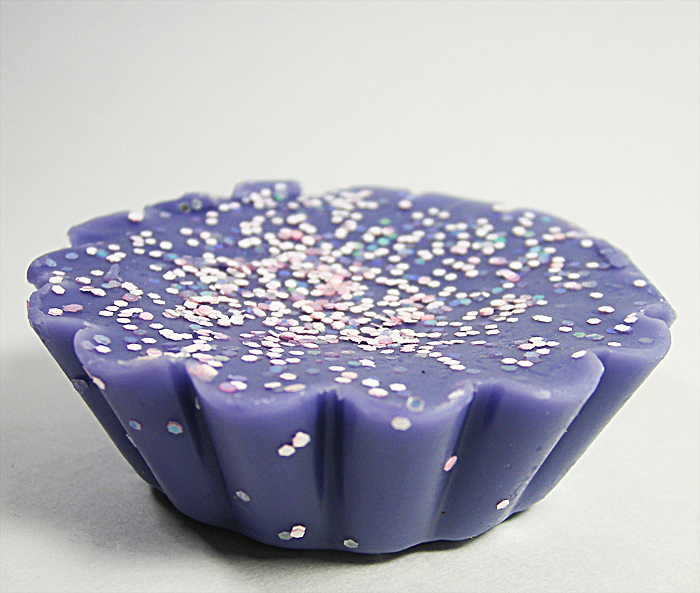 Sinfully sweet and quite strong cold throw for a bakery scent! Pink Bubble (Bazooka) - pink sugar and bazooka bubble gum blend. --Pink sugar kicked up a notch! A little sweeter and a little pinker! YUMMY! **Pink Lavender - Pink Sugar and Lavender. Pizzelle Picture a sweet vanilla waffle that is really thin and crunchy and looks like a giant snowflake. That's a pizzelle, a cookie the Italians have made famous. It's made in a pizzelle iron, similar to a waffle iron. Vanilla, sugar, butter baked into a delicate and artistic cookie. --My very first Pizzelle tart, and I'm quite happy about it! Smells just like a waffle cone baking in the hot cast iron press. A little light on cold throw, but I am excited to melt this one! **Purple Pixie Stix Nothing else taste like that grape powder candy in the skinny paper tube. It's a grape like no other with a bit of tartness that tickles the taste buds and then explodes into sweet grape candy. This one is spot on and fun! --yep, I get both notes in this; creamy vanilla spiked marshmallow and sweet red licorice! It has a fairly strong cold throw! Rice Krispy Treats Do you have a secret ingedient for your crispy rice cereal marshmallow bars? We like to add a little extra butter and the real secret, a teaspoon of vanilla in the melting marshmallows! Try it! Our blend mimics this childhood treat adults love to sneak. Marshmallow, butter, a little vanilla and crunchy rice crisps is what you get in this yummy treat! --cooked marshmallows, crispy rice and butter - a real treat! **Sweet Lime-a-licious Kisses This is a must try for everyone it is that good! A kiss of lime and a kiss of suagr is a kiss you'll crave more of! If you are a fan of Fresh Lemon Sugar oh how you're gonna love this fragrance! Fresh lime infused with sweet sparkling sugar crystals gently kissed by lemons. Incredible! --no joke, this is the best lime tart I have smelled. Its got super strong cold throw, yay! I cannot wait to melt this I think its going to be a nose hair burner! Tiramisu with Tony (Tony's tiramisu?) Tiramisu has changed dessert menus forever! Delicate sponge cake, soaked in amaretto, espresso, and chocolate with a kiss of cinnamon topped with whipped cream. Can anything be more decadent and European at the same time? --Now this is what baked alaska should have smelled like! Sweet Amaretto, the hint of coffee adds that burnt meringue scent, the chocolate smells more like a milky white cream to me, and I'm getting a sort of cake batter in this too. Absolutely no cinnamon note - I wonder if they accidentally swapped labels on these? I love it! This is another one that my scent twins, jennistarbrite and tgirl @MUA will love! Watermelon Candy Is this the one you reach for when you see a bowl of Jolly Ranchers? Mouth watering watermelon candy and we left out all the artificial notes! --oh my! The description is very accurate, it smells just like a watermelon jolly rancher!! Its really strong on cold sniff too! I LOVE this! **White Chocolate Macadamia Nut Cookie We really don't need a description for this one, do we? You really need this scent. Really, you do. Mediterranean Fig The classic fig scent blends earthy notes with sweet, ripe fig. The fig scent is recreated using cashmere woods, melons, lily, ripe strawberry and greens. This is a deep, ripe fig and not overly sweet. --Very rich and woodsy yet sweet. Just imagine a teeny wood nymph fluttering near wild berries nestled amongst sweet blades of grass! She's being sneaky as not to alert the campers sitting beside their campire. I think this is a really well balanced tart for someone venturing into the woodsy/warm scent category from bakery or even from clean/fresh as this does have a touch of green. If its not your usual M.O., give it shot - I can almost guarantee you'll like it! And if you don't, feel free to toss them my way! Pineapple Upside Cake This is always such an eye appealing cake when served, don’t you agree? A rich combination of sweet pineapples, vanilla flavored cake, with hints of orange zests, butter, and brown sugar. --I'm getting vanilla, sweet molasses from the brown sugar and perhaps a little butter. I'm not smelling candied pineapples or orange zest on cold throw. There is a good unusual scent in this that I cannot figure out. lol the tart smells great and I am very curious how it will smell while melting. Autumn Spice This is the way home should smell when the air is cold, leaves are blowing and your favorite afhgan is calling your name. Very cozy and comfy, a feel good scent! --Very very heavy cinnamon.I think I'm picking up a red delicious apple in the far distance. Cold sniff is very strong! Cactus and Sea Salt Interesting combination as you don't see cactus at the sea shore. I like to think of this one as a long distant romance, so perfect together. One of the most amazing scents you will ever smell. Stimulates the senses with oceanic accords and refreshing and shimmering top green notes giving this fragrance a signature of fresh sea spray. Sea moss and driftwood create a rich undertone. A must try. **Southern Tea Cake A beautiful afternoon tea on the wrap around porch of the farm house is what day dreams are made of. Picture yourself sipping sweet tea while nibbling delicate tea cakes filled with plump, sweet raisins and crunchy nuts. --oh. my. God. yep, this one is worth spelling it all out! Its sooo -sniffs- sooo -inhales- soooooo -considers taking a bite- YUMMY smelling. I have not ever smelled a tart quite like this. Delicate little raisin cake petit fours frosted with pastel colored icing and finished with sprinkles of crunchy nuts. A sip of tea, a cool breeze floating by, yes this one is all that and a bag of chips! 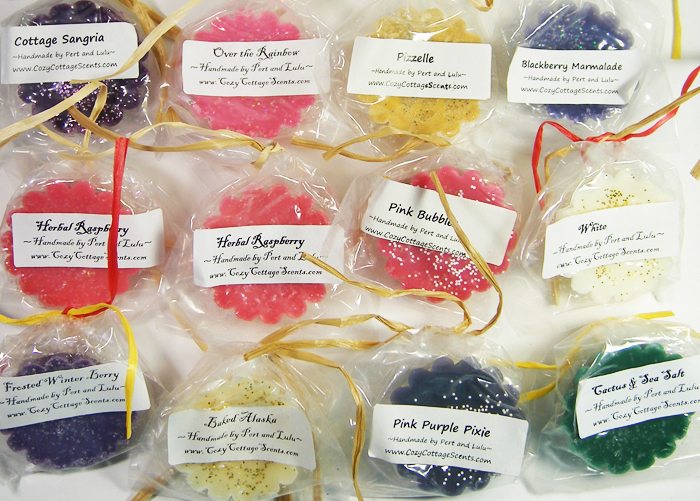 **Fruity Fizzy Pop Yes, you will smell the fizziness! A thirst quenching combination of red fruity berries, effervescent bubbles and fun. A feel good, happy scent! Fruity Sugar Sprinkles A sweet and fruity concoction of berries, bananas, apples, melons, and pears blended with French vanilla and sprinkled with sugar cane. --Wow! What an explosion of sugary sweet fruits! This one is going to be great to melt! **Herbal Raspberry We weren't sure what to expect with this scent however once we tested it, we knew it was a keeper and future best seller. Wow. Not too sweet, not too much berry! An intoxicating blend of raspberry that is mellowed by the scents of an herb garden. If a fruit scent could be described as fresh and clean, this would be it. --oh wow, this is like Haus of...well you know, raspberry in the raspberry cream soap. So super happy I got two of these, Its divine! Cozy Cottage Signature Pictue walking into a warm, welcoming cottage in the country and immediately feeling comforted and completely at home. This is our signature scent! A blend of all thing cozy, delicious and comforting including vanilla, sweet raisins, graham crackers, baking spices, and a bit of caramel. --exactly how its described! When I first opened the box of tarts, this is what the blend of all the fragrances smelled like. The descriptions mentions spice, but there is very little cinnamon, I barely even smell that note. I love this!! White - Pure. Cleansing. Refreshing. Uplifting. Captivating. Beautiful. Fresh. Perfect. Impossible to describe, everyone needs to experience this intoxicating scent. --yep, its all that! This is a crisp/bright white, almost like a hint of citrus in it. Its not like those fresh linen scents, its more like a fresh soap. I really love this and think it would be the perfect melt after cleaning house! Chocolate Rasberry Drizzle Decadent and aromatic with dark chocolate notes surrounding tart raspberries. Aromatic green notes soften the chocolate accord. --Heaven sums it up nicely! Pure semi-sweet chocolate covering a truffle center of succulent raspberry. I want to bite into this! Pink Purple Pixie - Pink sugar and purple pixie stix, how could I not love this one! ?